Town in the district of Mohilev, province of Podolia, Russia, on the River Rov, affluent of the Bug; with a Jewish population of 8,000, of a total population of 10,614 (1897). The Jewish community of Bar is one of the oldest of Podolia. The town was formerly called "Rov," and was destroyed by the Tatars in 1452. In the sixteenth century it received its new name in honor of the queen Bona Sforza, who was born at Bari, in Apulia, Italy, and by whom it was rebuilt. Among the seventeen landlords entered in the lists of the aldermen of Bar in 1565, there are mentionedsome Jews who bear Slavonic names; e.g., in the Polish part of the city: Moshko, Volchko, Schmoila; and in the Jewish street: Tzimlya (a Jewess), Zhivnitza (= Chaja, a Jewess), Maiko, Sablika, Moshechko, Volchkov, Kostzina (a Jewess), Marechko, Biskova (a Jewess) ("Regesty i Nadpisi," No. 541). In 1648 Krivonos, by order of Bogdan Chmielnicki, destroyed the town of Bar (then a fortress)and killed all the Poles and Jews. An old Russian chronicle of this persecution says that the Cossacks "flayed the Jews alive" (ib. No. 901). 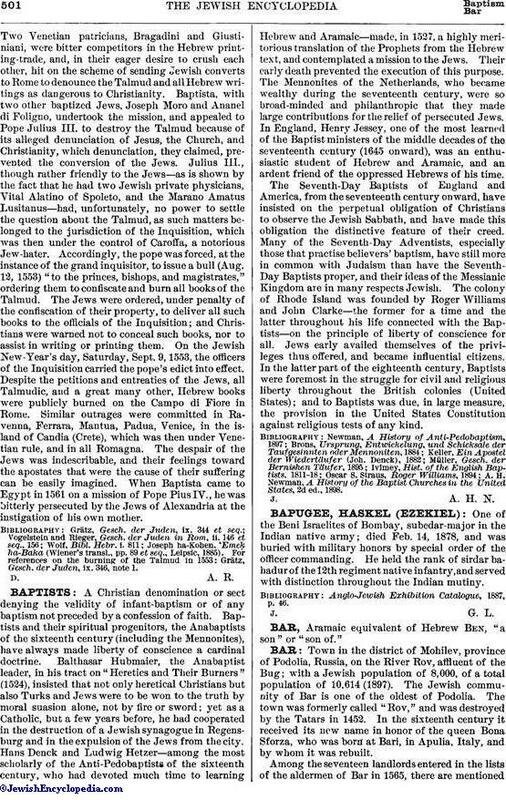 The number of Jews killed at Bar is given as 15,000 by Samuel Faibush and Kostomarov, and as 2,000 by Nathan Hannover. The latter is probably correct, as may be seen from the South Russian chronicles published by Byeloozerski (ib. Nos. 902 and 903) that Krivonos killed Poles and Jews, together over 15,000. 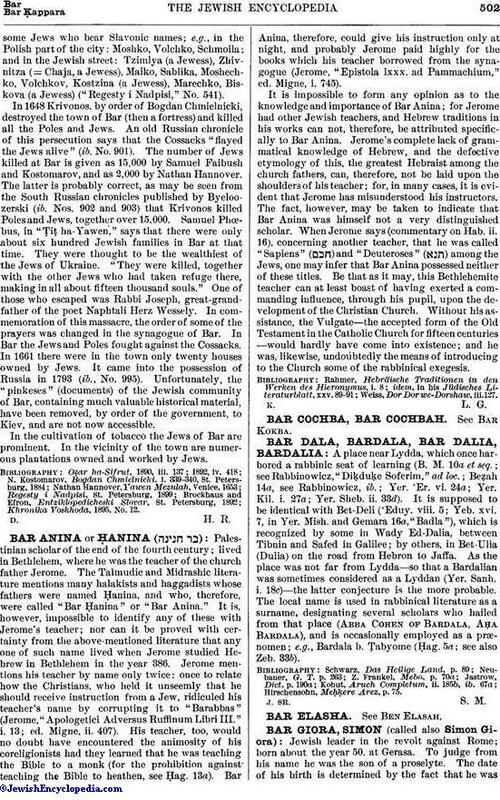 Samuel Phœbus, in "Ṭiṭ ha-Yawen," says that there were only about six hundred Jewish families in Bar at that time. They were thought to be the wealthiest of the Jews of Ukraine. "They were killed, together with the other Jews who had taken refuge there, making in all about fifteen thousand souls." One of those who escaped was Rabbi Joseph, great-grandfather of the poet Naphtali Herz Wessely. In commemoration of this massacre, the order of some of the prayers was changed in the synagogue of Bar. In Bar the Jews and Poles fought against the Cossacks. In 1661 there were in the town only twenty houses owned by Jews. It came into the possession of Russia in 1793 (ib., No. 995). Unfortunately, the "pinkeses" (documents) of the Jewish community of Bar, containing much valuable historical material, have been removed, by order of the government, to Kiev, and are not now accessible. In the cultivation of tobacco the Jews of Bar are prominent. In the vicinity of the town are numerous plantations owned and worked by Jews. Khronika Voskhoda, 1895, No. 12.